Women may feel like their symptoms aren't taken seriously and that they're told to stop worrying. (HEALTH.COM) -- Ashley Price felt terrible. She was tired, dizzy spells came and went, dark splotches popped up on her chest for no reason, and she'd gained 50 pounds in two years. Some days she was starving; other days she could barely eat. Her doc suggested that her problems would go away if Price just ate less and exercised more, even though she was dieting and working out regularly. Price demanded thyroid tests, only to have them come back normal. Her doctor told her: "I have no idea what it is. Wait for it to go away." It didn't go away. "I could no longer think straight, no matter how hard I tried or what I did," Price says. Worse, she suffered three straight miscarriages. Finally, four years after this nightmare began -- after the third miscarriage -- an ultrasound revealed that her ovaries were riddled with cysts. She had polycystic ovary syndrome, a hormonal disorder; symptoms include irregular periods, infertility, brain fog, and obesity. Price's gynecologist prescribed metformin, and she finally got some relief. "I had myself back," she remembers. "I had energy, I could think, I wasn't starving all the time." Best of all, she finally had a baby, born last June. Price isn't alone. Experts say more women than we know walk out of doctors' offices feeling that their symptoms haven't been taken seriously. They are told that their complaints are all in their heads or that everything will be fine if they would just stop worrying. The truth: Women who know something's wrong but can't get the help they need often have an autoimmune disorder, which occurs when the immune system attacks itself. One in five Americans has one, and three-quarters of them (about 22 million) are women. 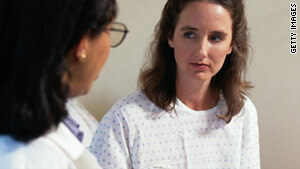 Some women live with unbearable symptoms for 10 or 15 years before finally getting the right diagnosis and treatment. "More than 40 percent of women eventually diagnosed with a serious autoimmune disease have basically been told by a doctor that they're just too concerned with their health or they're a hypochondriac," says Virginia Ladd, founder and executive director of the American Autoimmune Related Diseases Association. What's the best way to avoid Price's fate and get help fast? Ladd and other health experts say you must educate and empower yourself by learning the names, risk factors, symptoms, and treatments for the seven most commonly misdiagnosed women's illnesses described here. Then push your physician to take you seriously. I had myself back: I had energy, I could think, I wasn't starving all the time. Polycystic ovary syndrome -- the most common hormonal disorder among women of reproductive age (as many as 1 in every 10 women of childbearing age will develop it) and the leading cause of infertility -- stems from having levels of androgens, or male hormones, that are too high. The androgen overload is actually caused by an imbalance in insulin, the hormone that helps regulate blood sugar. "Insulin is a growth hormone, and it makes you fat," says Dr. Katherine Sherif, co-director of the Center for Polycystic Ovary Syndrome at Drexel University College of Medicine in Philadelphia, Pennsylvania. Excess insulin bombards the ovaries, causing them to produce too much testosterone and develop cysts. Half of all women with PCOS end up with prediabetes or diabetes. Besides irregular periods, or none at all, you may notice more hair on your face, chest, back, and limbs. Also typical are acne, baldness, and rapid, substantial weight gain (more than 10 pounds a year) that seems impossible to control. No single test does the job. Instead, the doc needs to know your symptoms. Then she'll check your reproductive organs for signs of masses or growths using a pelvic or vaginal ultrasound and physical exam. Blood tests are used to measure levels of glucose and several hormones; they also can exclude abnormalities, like hypothyroidism, that mimic PCOS. There's no cure, so treatment is designed to manage the symptoms and prevent infertility, diabetes, or heart disease. Birth control pills help regulate menstrual cycles, lower androgen levels, reduce hair growth, and clear up acne. Metformin, which controls blood glucose and lowers testosterone production, can help you lose weight. Doctors aren't sure what causes the widespread pain that characterizes this disorder. They think the brains of people with fibromyalgia -- 3 million to 6 million women in the United States alone -- may interpret ordinary sensation as painful, what's known as central sensitivity syndrome. Symptoms, which usually develop during early and middle adulthood, include pain, numbness, and exhaustion. "It's like someone has turned up the volume in the nervous system," says Dr. Cassandra Curtis, a neurologist in Indianapolis who frequently treats fibromyalgia patients. A physical exam and lab tests can't find fibromyalgia, says Dr. James Leisen, division head of the department of rheumatology at Henry Ford Hospital in Detroit, Michigan. Instead, doctors check for widespread pain lasting at least three months and do a tender-point exam, which identifies places on your body that are painful to the touch despite no signs of redness or swelling; the test is positive if at least 11 of the 18 points are tender. Over-the-counter pain meds like acetaminophen, ibuprofen, and naproxen, as well as antidepressants (to treat pain and improve sleep patterns) are recommended. A prescription drug called Lyrica is helpful in some cases. Studies show that exercise helps, but it's important to go slow with a workout program. Massage, stretching, and any kind of stress relief may ease the hurt. "If patients are upset and emotional, the pain becomes worse," Leisen says. Nobody knows what causes the extreme fatigue common to chronic fatigue syndrome. But studies point to dormant viral infections, hormonal imbalance, and stress. At least 1 million Americans are believed to have CFS, though less than 20 percent have been diagnosed. Women, especially in their 40s and 50s, are four times as likely as men to have it. "It may have something to do with hormonal changes and menopause," says integrative medicine expert Dr. Erika Schwartz, medical director of Cinergy Health, who treats women with hormonal disorders. The fatigue usually worsens with physical or mental activity and doesn't improve with rest, so people with CFS often function at a substantially lower level than they did before getting sick. Tasks like getting ready for the day or cleaning a room, which usually require an hour, may take several hours, if not days. Loss of memory or concentration and unexplained muscle pain are common, too. There's no test, so before arriving at the diagnosis, a doctor will rule out other diseases or conditions that may cause similar symptoms -- like mononucleosis, Lyme disease, thyroid problems, or depression. A 2006 study found that psychostimulants like Ritalin lessen fatigue and improve concentration in some people, but the treatment is experimental. Most docs suggest moderate daily activity and exercise to boost stamina, plus more rest, and stress, alcohol, and caffeine reduction. Schwartz also prescribes bioidentical hormones: "Many patients improve when their hormones are balanced." There are four types of lupus, but you hear most about systemic lupus erythematosus, a malfunction in the immune system in which your body becomes its own worst enemy. Skin, joints, lungs, kidneys, the nervous system, or blood pay the price. Each year, more than 16,000 people in the United States are diagnosed with lupus -- 90 percent of them are women. Scientists suspect that hormones play a role because most women are diagnosed between ages 15 and 45, and lupus seems to strike during or following pregnancy. Symptoms include fatigue, fever, joint pain and stiffness, chest pain, memory loss, and skin lesions. Most people experience flares -- worsening of symptoms that may later improve or even disappear completely. Lupus is confirmed if you have at least four of these symptoms: a facial rash or rashes that appear after exposure to sunlight, painless mouth sores, kidney disease, swelling of the lining around the lungs or heart, and low counts of red blood cells, platelets, or white blood cells. For mild cases, ibuprofen and naproxen can reduce pain and swelling in joints and muscles, and antimalarial drugs like Plaquenil (generic: hydroxychloroquine) have proven useful in preventing flares and controlling the disease's progression. Corticosteroids counter inflammation, but they can have long-term side effects. Increased physical activity and emotional stress may trigger an episode, too, so learning to balance activities and emotions is an important part of coping with lupus. Diets rich in omega-3 fatty acids and alpha-linolenic acid (found in flaxseed) may also help reduce inflammation associated with the disease. Multiple sclerosis strikes when your immune system attacks the protective covering of the nerves (called myelin) in the brain and nervous system, breaking down communication between the brain and body and sometimes destroying the nerves themselves. Women are three times as likely to be diagnosed with MS, and it generally appears between ages 20 and 40. One in 1,000 people develop the disease, and the risk is higher if there's a family history of it. Most scientists believe there's an environmental link, like viruses or toxins. Early symptoms can include numbness or weakness in one or more limbs, tingling or dull pain, fatigue, and vision problems. MS may seem benign (with few or no symptoms) or completely disabling, and researchers can't tell how a person's disease will progress. Some sufferers, like talk-show host Montel Williams and actress Teri Garr, maintain a relatively normal life; others find themselves needing constant assistance as the disease progresses. "They're working two to three times as hard as the normal person to get through the day," says Dr. Jerry Wolinsky, director of the Multiple Sclerosis Research Group at the University of Texas Health Science Center in Houston. There are no definitive tests for MS, although in recent years doctors have begun using optical coherence tomography to analyze nerves in the retina. Other tests are used to help rule out conditions with MS-like symptoms -- blood tests for infectious or inflammatory diseases like Lyme disease, spinal taps for viral infections. An MRI can sometimes uncover lesions, which indicates that the myelin is deteriorating. Some people have mild symptoms and can be treated just with corticosteroids. But most sufferers are put on an immunomodulator drug like interferon beta or glatiramer acetate to reduce the likelihood of relapse. Rest is crucial, and occasional exercise can improve strength, muscle tone, coordination, and balance. It's also important to stay out of the heat, because it may trigger extreme muscle weakness. Read how yoga can help ease MS symptoms. Rheumatoid arthritis attacks the linings of the joints (called synovium) via the immune system, causing swelling, aching, and potential deformity in hands, wrists, hips, knees, and feet. Women make up three-quarters of RA cases (about 1 million in the United States). Symptoms occur at any age but generally peak between 40 and 60. RA can make even the simplest activities -- opening jars, climbing stairs, putting on clothes -- difficult and painful. "It also has the curious propensity to be symmetrical: If one joint on one side of the body is involved, the other joint on the other side will usually be involved as well," Leisen says. Other symptoms include stiffness (especially after waking), joints that are tender to the touch, fatigue, and fever. Women typically find that RA goes into remission while they're pregnant but returns after giving birth. RA can be difficult to diagnose in its earlier stages. Symptoms can be similar to other types of arthritis -- there are 212 in all -- and may not show up for years. Blood tests, which look for an antibody called rheumatoid factor (present in 80 percent of RA patients) may be ordered. Two tests that measure inflammation -- C-reactive protein and sedimentation rate (for measuring how fast red blood cells fall to the bottom of a test tube) -- may also be done. X-rays are taken over time to determine the level of joint deterioration, because the disease may not show up at first. In recent years, tumor necrosis factor alpha inhibitors, drugs that fight an inflammatory protein, and DMARDs (disease modifying antirheumatic drugs like methotrexate) have helped slow, reduce, and prevent joint damage. Corticosteroids can cut inflammation, though they may become less effective over time and don't halt disease progression. High doses of omega-3 supplements might ease the pain and stiffness, too, some experts believe. Irritable bowel syndrome -- chronic abdominal cramping and pain, bloating, gas, diarrhea, and constipation -- may be caused by a malfunction in the way the brain and gut communicate, says Dr. David Greenwald, associate director of the division of gastroenterology at the Montefiore Medical Center in Bronx, New York. Up to 20% of Americans have IBS, but it's twice as common in women. Researchers think a woman's menstrual cycle may be partly responsible. Some people experience only diarrhea; others, only constipation. You might have a little of everything -- including big-time pain. Fatty, greasy foods and dairy products can cause IBS to flare up or worsen. Coffee, alcohol, and caffeine can lead to loose stools or diarrhea. Your doc may use what's called the Rome criteria to make a diagnosis; one criterion is 12 weeks of symptoms in 12 months. Fiber (the kind found in many fruits and vegetables including broccoli, cabbage, cauliflower, and in whole-grain breads) or fiber supplements add bulk to the stool, making it easier for some to go. But too much fiber may worsen symptoms, especially bloating and gas. Antidepressants (in much lower doses than used for treating psychological conditions) may help slow down the neurons that control the intestines and decrease the bothersome sensations linked to bloating and gas. Research also suggests that peppermint, a natural antispasmodic, sometimes can ease abdominal pain. Even hypnotherapy may be useful; check IBShypnosis.com for therapists.